The recently concluded Cannes film festival has brought tremendous joy to us with Neeraj Ghaywan's 'Masaan' winning two awards in the Un certain regard category. It is a matter of pride for us, and we hope that every year movies from India continue this trend of making noise at the big places. Their approval matters, not as a stamp of quality, but to increase the reach of our films. Their approval matters because it can only benefit our cinema. I have been optimistic about the future of our cinema, and the success of 'Masaan' at Cannes has come as a big boost. OPENING FILM: Unagi (The Eel) (1997/ Japan) by Shohei Imamura: Palme d'Or winner. What gripping story! Keeps you expecting and gives you exactly something new. My festival got a great kick-start with this. Timbuktu (2014/ Mauritania) by Abderrahmane Sissako: Won two awards (Francois Chalais Award and Prize of the Ecumenical Jury). Went on to earn an Oscar nomination, for Foreign-language film. Its stunning locales and exotic music was a delightful experience. Lenny (1974/ USA) by Bob Fosse: Won Best Actress for Valerie Perrine. It eventually earned six Oscar nominations, but no wins. I liked it in parts. But added an interesting variety to the festival. Harakiri (1962/ Japan) by Masaki Kobayashi: Won Special Jury Prize. It took time and I was getting irritated by its structure of flashbacks. But by the time it ended, it had won me over! A real classic! Fish Tank (2009/ UK) by Andrea Arnold: Won Jury Prize. Rewatch for me, after five years. I remember being pleasantly surprised by this little movie at my first Mumbai Film Festival. It can be called the 'Short Term 12' of UK! Only it came earlier. Il Divo (2008/ Italy) by Paolo Sorrentino: Won Jury Prize as well as Vulcain Prizes for cinematography and sound mixing. Went on to earn an Oscar nomination, for Make-Up. I did not particularly enjoy the film, except for its real-life connection. Mulholland Dr. (2001/ USA) by David Lynch: Won Best Director. Went on to earn the Oscar nomination for Best Director. Rewatch after eight years. Was still so engrossing! However, since over these years I have come to go more for heart than mind, its impact was much lesser. The Barbarian Invasions (2003/ Canada) by Denys Arcand: Won Best Screenplay as well as Best Actress for Marie-Josee Croze. Went on to win the Oscar for best foreign-language film. One of those films that makes you laugh and cry, effortlessly. Beautiful, and sweet. And real fun. The Ice Storm (1997/ USA) by Ang Lee: Won Best Screenplay. One of those films about dysfunctional American families and their parallel tracks. Had I watched it before 'American Beauty' and others, it would have worked better for me. 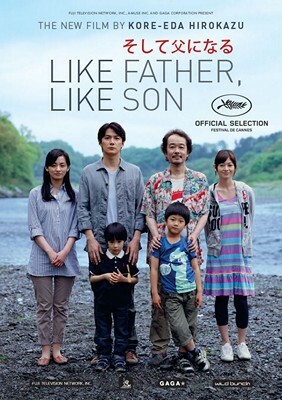 Like Father, Like Son (2013/ Japan) by Hirokazu Koreeda: Won Jury Prize as well as Special Mention by Ecumenical Jury. Perhaps my favourite of this line-up. What universal, timeless story! And very moving. A delightful experience! Force Majeure (2014/ Sweden) by Ruben Ostlund: Won Un Certain Regard Jury Prize. Went on to earn a Golden Globe nomination for best foreign-language film. I really, really liked the film. I should re-watch it, especially for its understated but sure-footed writing. I was very impressed. Leviathan (2014/ Russia) by Andrey Zvyagintsev: Won Best Screenplay. Later won the Golden Globe for the best foreign-language film, apart from an Oscar nomination in the same category. Woked well for me. But the insistence on a message was slightly disappointing. I would prefer Force Majeure over this. CLOSING FILM: Mad Max: Fury Road (2015/ Australia-USA) by George Miller. I went to watch it at PVR Phoenix, so not exactly in Andheri. But what an experience! Have we ever seen a movie like this? I hope to watch it again, very soon. And this time at IMAX.